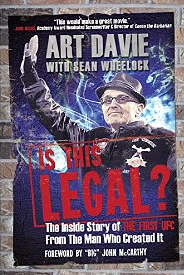 I have finally had a chance to read Is this Legal, a book written by UFC co-founder Art Davie. The book accounts “how Davie started the Ultimate Fighting Championship, and launched mixed martial arts” in the US. The 260 page book is a great read for any fan of combat sports. I was 16 when UFC 1 was broadcast on PPV and have been following the sport for over twenty years. I thought I knew a lot about the history of the sport but Is This Legal was quick to correct this view. Just as a first grappling lesson quickly teaches strikers that they have a lot to learn about fighting, Is This Legal teaches combat sports fans that they have a lot to learn about the true history of UFC 1. Well done Art.